Sim-net.com is Sim-phony’s Confidential Messaging Platform, a leading edge, secure, and private messaging technology able to be easily integrated to your existing business processes. Sim-net.com makes it possible for your existing corporate communications platform to be GLBA, HIPAA, PHIPA, PCI DSS, immediately compliant with no up front hardware or software purchase. Enjoy the benefits of policy driven, encrypted email with in your familiar messaging platform and watch your courier and postal costs drop while your business velocity increases. Email platforms such as Exchange, Notes, webmail, or Smartphone services rely on a standardized open protocol technology called “Simple Message Transport Protocol (SMTP)” that encapsulates messages for transport over the internet to intended recipients. However now a days hackers have developed techniques for capturing these messages and deciphering the content making the delivery of personal or confidential information through un-encrypted email a very risky proposition, or even against the law in some instances. Sim-net.com is a secure platform utilizing internet banking security-strength encryption to ensure content confidentiality and various industry privacy compliance standards are never be breached. Sim-net.com is a “software + services” business model combining our secure Private Email Network either with your MS Outlook, Lotus Notes, Webmail or Smartphone device, so that messaging can be initiated and received securely, on demand or through policies, at any time. All of your existing email contacts can be delivered a secure message. Simply follow your normal procedure for sending an email, select a contact, and then decide upon your delivery method i.e. “Secure” or “Proceed Normally”; click appropriately. 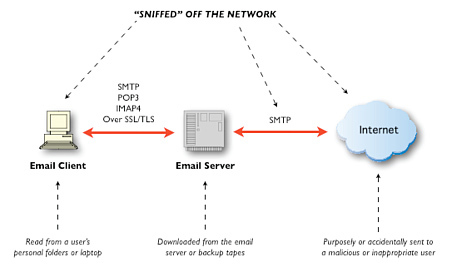 Unlike basic email, there is no intermediary routing to SMTP servers. All connections use the secure HTTPS protocol (HTTP + SSL) with a minimum of 128-bit SSL encryption. It’s simple; there is no PKI password to remember or IT involvement required. Your intended email recipient can be anyone. Pre-qualified security end points do not exist with Sim-net.com; simply send your contact a message. If you have not already exchanged a secure email with this contact, a web hyperlink will be delivered to their email. When they select the hyperlink, an automatic script will unfold presenting your personal invite message and a secure web site where they can decide to initiate a secure connection to receive your email. Any attachments you included will then be available for download by the recipient if they desired. Reduce Expenses associated with courier and postal of delivery confidential documents. Turn-around Contracts, Financials, or Confidential Information immediately with out the nedd tho exchange paper. Gain valuable delivery stage information around the communication of important documents with the ability tho immediately recall the message should the need arise during the process. Extend your corporate email platform investment to include confidential, policy based, encrypted communication capabilities.